A parish nurse, also known as a faith community nurse, is a nurse who cares for members of a parish or faith community. They integrate faith and healing to promote wellness within the community they serve. It is a relatively new specialty of nursing, beginning in the 1980s in Chicago. According to the Health Ministries Association, it was officially recognized as a specialty in 1998 by the American Nurses Association. Scope and standards of practice for faith community nurses were first published at that time as well. A parish nurse should have a keen sense of community, the desire to help others, and have an unshakeable foundation and knowledge in their spiritual beliefs. As with any nurse, they must demonstrate compassion and patience with the community they serve. Since parish nursing can be emotionally demanding, nurses should be able to adequately handle stress and emotionally draining situations and have a dedicated support system of their own. What Are the Education Requirements for a Parish Nurse? Those interested in the specialty of parish nursing should first pursue a nursing degree through a two or four-year university. Obtaining an Associate's Degree in Nursing (ADN) or a Bachelor's of Science in Nursing (BSN) degree is required. Many organizations prefer BSN-educated nurses, as they complete training in community/public health, which is a large component of parish nursing. Certification is obtained via portfolio/online application and is valid for five years, at which time re-certification is offered. Find a faith based nursing school. Where Do Parish Nurses Work? What Are the Roles & Duties of a Parish Nurse? 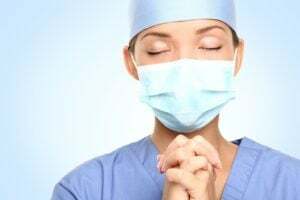 While there is no published data specifically describing parish nursing, the field of nursing is expected to grow 16% by 2024, according to the U.S. Bureau of Labor Statistics. This is a much faster than average growth, and it is possible that faith community/parish nursing is included. While there is no published information specifically on parish nurse salary, indeed.com reports the average salary for registered nurses, in general, is $71,081 annually. This figure may vary depending on city and state of employment, any certifications held, and the organization.